Mike Love keeps growing and grounding through his music, while staying true to his Hawaiian roots. Catch him at Wanderlust O’ahu in 2019! 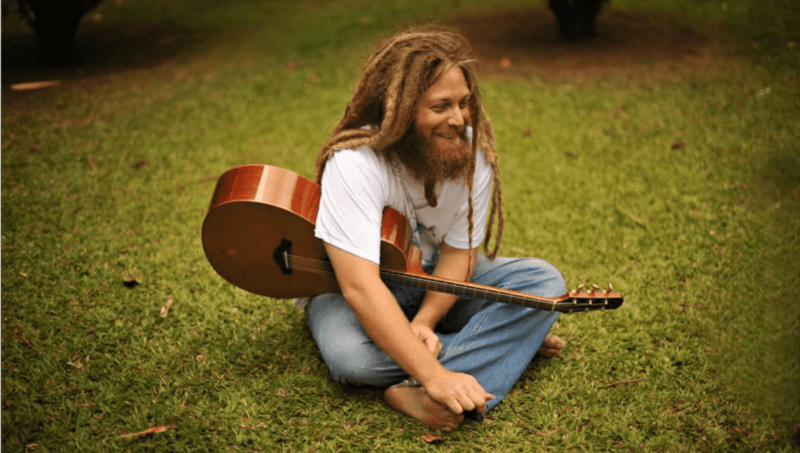 Check out Mike Love at Wanderlust O’ahu 2019! For tickets and more information, please click here. Mike Love is a musician devoted to revolution through sound. Born in O’ahu, Hawaii to a family of musicians, Mike has used music as conversation for as long as he can remember. He comes from a unique convergence of influences, yet all are bound by their common ambition to inspire positive change in the world. He releases his music independently on his own Love Not War Records label, and his sound is not bound to one genre but spans his variety of influences, including roots reggae, classical, and rock music. Mike’s songs possess wisdom and seek to instill change, whether it be regarding issues of the environment, animal cruelty, or personal growth. They are about being conscious and mindful as human beings living amidst so many other life forms on this beautiful planet. For Mike, music is a form of healing, learning, and growing. We had the pleasure of speaking to Love about his background, influences, and points of inspiration. Wanderlust (WL): How did you first come to music? Was music always a large part of your life? Mike Love (ML): I was born into it. I can’t remember a time when I wasn’t singing and playing instruments. Melody, rhythm, harmony: They all seemed sort of innately built into every aspect of my life for as long as I can remember. My family has always been very musical, and my parents always supported me experimenting with different musical instruments and styles. WL: Who are some of your biggest influences? How do these influences play into your unique sound? ML: My biggest influences have always been my family. My parents, my sister, my grandpa, they all provided good examples for me to grow, musically and spiritually, and ethically. When I really became passionate about writing my own songs, I was listening to bands like Pearl Jam, Smashing Pumpkins, The Beatles and Soundgarden. I’ve been through so many different phases of being really into learning a certain style of music, like delta blues or flamenco or jazz, but when I started making reggae music is when everything shifted in a more spiritual direction. I started listening to more than just “One Love” and “Stir It Up” by Bob Marley, which we grew up listening to. I discovered artists like The Congos, The Abyssinians, and Israel Vibrations and the world of Rastafari unfolded before me. It was a great time of growth for me. WL: What is your writing process? Do you write the lyrics first and follow with music or vice versa? ML: There are really no rules or process to it, I just open myself up as a vessel and it comes through. Be it a lyric, a melody, a rhythm, a bassline, or just a concept, it starts wherever it starts and grows from there. Sometimes songs come through and are written in a day or two, or sometimes they unfold over the course of many years. I never restrict myself to forcing any idea to come through and manifest itself, I just let them come and learn from them and try to ready them to help heal and teach others, just as they heal and teach me. WL: Your lyrics are beautiful and profound simply as text. Do you write based on your personal experience, or from a greater perspective? ML: I find sometimes the lyrics that come through to be so direct and matter of fact. When I listen to the lyrics of someone like Bob Dylan or Jeff Buckley I think, “wow, I could never write something so beautiful or profound.” But I guess everyone has their own way and voice. I draw lyrics from reality, from my personal relationships, from the relationships of others, of humanity as a whole, and from the world we live in. This life is a journey, a learning journey, and writing things down or singing them sometimes helps us to work out things that we might not realize are happening right in front of us. It helps to hear people sing or speak or write about them as well. We all interpret things in our own ways. That’s what’s so beautiful about this music. It’s amazing how universal someone’s personal experiences can be, and how healing it can be to see that reflection in others. WL: Is there a specific place that inspires you to write? ML: I see many people around me who avoid being creative by making excuses about the circumstances or conditions not being right or conducive to imagination. I learned long ago that an idea can strike in any place at any time of day, and if you ignore it, it’ll be lost. I write music whenever it comes, whether it be sitting on my couch, driving in my car, in a hotel room, whatever. It’s what keeps me growing and keeps me grounded. WL: You use a lot of distortion pedals to produce a unique sound. Do you use them to play over other loops so that you can create a fuller sound? ML: Yeah, I do use a lot of different effect pedals. I do a lot of live looping and live dub effects. Very often people ask me about the tracks I’m playing while performing and they don’t realize that nothing is ever pre-recorded, that everything is done live. It’s a unique aspect of what I do that’s become somewhat of a signature for me. No matter whether I’m playing solo or with my band, The Full Circle, I still do plenty of looping. WL: What does a typical day look like for you? ML: My life is pretty erratic, I don’t have any sort of typical schedule. I do my best to spend the majority of my time with my wife and children. I spend quite a bit of time traveling around the world playing music. My ideal day is going to the beach or hiking to a waterfall with my family. I’m addicted to playing music. When I’m not on the road I still play 4 or 5 nights a week around town on my island home, O’ahu. Catch Mike at Wanderlust O’ahu in 2019. See you on the North Shore!